Henry Ebbage was a pharmaceutical chemist, who prepared and sold microscope slides as an additional source of income. The earliest identified evidence suggesting that Ebbage made slides for other people dates from 1885. He was definitely a professional mounter by 1889, when Ebbage opened up his first business, a combination chemists’ and microscopists’ shop. D.S. Spence called Ebbage “the most peripatetic of professionals”, on account of the large number of moves Ebbage made around England during his lifetime. Ebbage became interested in microscopy during his training in pharmacy, and his many early relocations were due to schooling and assistantships. The reasons for his moves after certification are not conclusively known, but suggest that he was often looking for a better business opportunity. In 1903, Ebbage passed certification as a spectacle maker, and shortly thereafter settled down for the rest of his life in Kingston-on-Thames, working as an optician. He reportedly ceased making microscope slides by 1910. Figure 1. 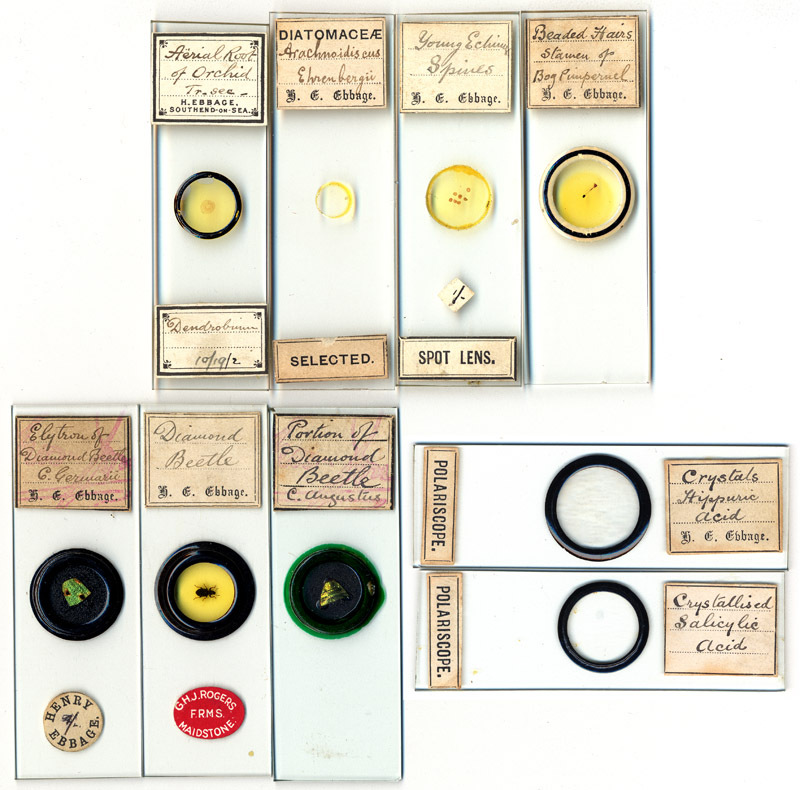 Examples of microscope slides prepare by Henry Ebbage. He prepared a wide variety of botanical, animal and chemical slides. Note that he did not always use personalised labels, although such slides are generally recognisable by the handwriting. These unsigned slides may have been intended for distribution through other retailers. The slide of a whole diamond beetle on the lower row carries an additional label from G.H.J. Rogers (1854-1937), identifying that it was once in that man’s personal collection. Henry Edward Ebbage was born November 15, 1862 in Halesworth, Suffolk. His father, William, was a bank clerk. The family was at least moderately affluent, as they employed domestic servants. In January, 1879, 16 year-old Henry passed his preliminary examinations to become an apprentice/student pharmaceutical chemist. The 1881 census found Ebbage working as an assistant to (and living with) pharmacist Martin Hetherington of Yoxford, Suffolk. In 1883, Ebbage sought to obtain a microscope (Figure 2A). This interest in microscopy may have stemmed from educational proposals that pharmacy students learn to microscopically examine the purity of botanicals and chemicals. Henry advertised from 34 Queen Square, Wolverhampton, Staffordshire in 1883 and 1884 (Fig. 2A and B). That was the address of William Cattrell’s pharmacy during 1885, so Ebbage was presumably a trainee with Cattrell. In March, 1885, Ebbage requested a copy of Lionel Beale’s “How to Use the Microscope”, a very useful book on all aspects of microscopy (Figure 2C). He used his parents’ address of Halesworth. He may have been living with them at the time, or used their address because he was moving again. That April, a “Mr. Ebbage”, who was probably Henry, advertised from Watton, Norfolk, to exchange photographs for microscope slides (Figure 2D). The next month, Henry was advertising to exchange microscope slides, possibly of his own making or they may have been unwanted acquisitions (Figure 2E). This is the earliest known record of Henry Ebbage offering to provide slides. That advertisement listed Framlingham as his address. Henry’s parents moved from Halesworth to Framlingham between the 1881 and 1891 censuses – this advertisement indicates that the move occurred in the spring of 1885. In July and September of 1885, “Mr. Ebbage” both offered and requested microscope slides (Figure 2F, G and H). Given the evidence that Ebbage was interested in mounting slides, it is possible he wanted examples of other people’s work in order to copy their techniques. The address used in those advertisements - 8 Lowfield Street, Dartford, Kent - was the chemist’s shop of James Cann, apparently another of Henry Ebbage’s mentors. Figure 2. The Evolution of a maker of microscope slides. 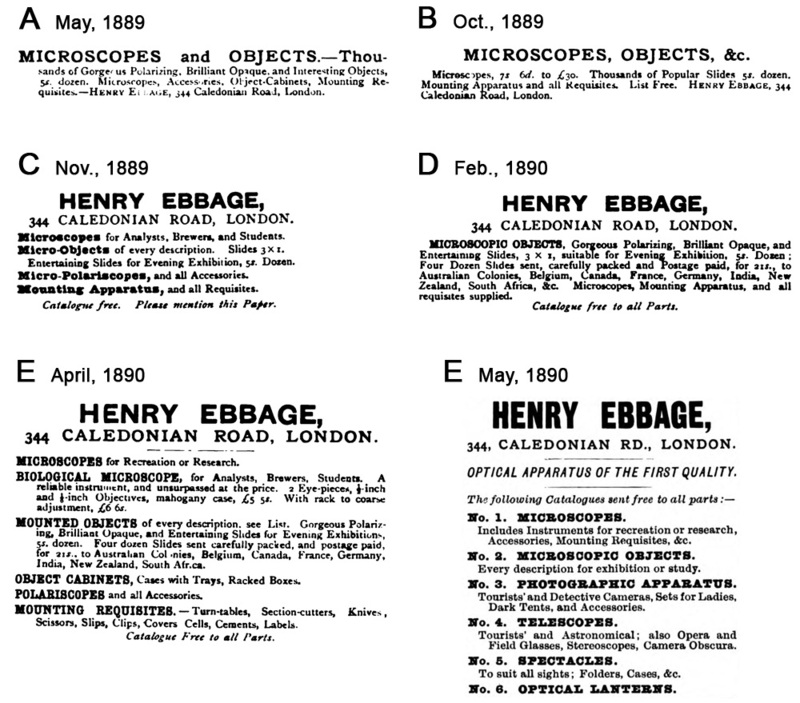 (A) In 1883, Henry Ebbage advertised to acquire a microscope. (B) 1884. Probably looking to unload study aids from his training in pharmacy, Ebbage looked for an exchange that would be useful to him as a chemist or as a microscopist. (C) In March, 1885, Ebbage was looking for Beale’s comprehensive work on microscopy, a very useful source of information on how to prepare objects for microscopical observation. (D) April, 1885, looking to acquire slides. (E) May, 1885, Ebbage offered to provide microscope slides. These may have been his own preparations, or may have been acquisitions he did not want to keep. (F) July, 1885. (G) Also July, 1885, asking for slides. (H) September, 1885, offering microscope slides for fishing tackle. By mid-1886, Henry had made another move, this time to an assistantship in Edgbaston, Birmingham. The address he provided on exchange offers, 165 Hagley Road, was the chemists’ shop of George McIsaac. Ebbage mentioned his Birmingham assistantship several years later, in a published commentary on his practice of charging customers a surcharge to fill orders in the middle of the night (Figure 3A). An exchange offer from 1886 indicates that Ebbage was still looking for a good deal on Beale’s microscopy book (Figure 3B). Through 1887 Ebbage was still requesting to receive other people’s microscope slides (Figure 3C and E). However, he also asked for insect specimens, a good sign that he was getting serious about making microscope slides. The slides he offered in exchange may have been of his own making (Figure 3D). Figure 3. Information from Henry Ebbage’s assistantship in Birmingham, 1886-87. (A) A reflection from Ebbage, 1895. (B-E) Exchange offers that appeared in Hardwicke’s Science-Gossip in May 1886, May 1887, October 1887 and November 1887, respectively. The October 1887 ad suggests that Ebbage was producing substantial numbers of microscope slides. Henry Ebbage passed his final examinations on October 20, 1887, and was “declared to be qualified to be registered as (a) Chemist and Druggist”. He presumably stayed with his Birmingham position for a while longer, since he posted an exchange request in the November, 1887 issue of Hardwicke’s Science-Gossip (Figure 3E). I have not located any information on Ebbage between the end of 1887 and the end of 1888. Presumably, he was busy setting up his first independent business, at 344 Caledonian Road, London. In November, 1888, Ebbage offered to provide slides in exchange for “good books on microscopy”. The following month, he sought to acquire “micro slides” in exchange for an “air-pump with bell glass, also cyclostyle apparatus for printing circulars, lists, &c., both new”. His business was soon to heavily advertise microscopes, slides and supplies for sale, so Ebbage may have been looking for slides and books to re-sell. By May of 1889, Henry Ebbage was a legitimate professional microscopy retailer (Figure 4). He produced a catlogue that October, to be sent to potential customers, free of charge. Figure 4. Advertisements for Henry Ebbage’s new establishment, which heavily featured microscopy and other optical pursuits. Although Ebbage made microscope slides, there is no evidence that he manufactured the microscopes, telescopes and other apparatus which he sold. He did, however, become a certified eyeglass maker in 1903, so it is possible he was making spectacles as early as 1890. Advertisements A-E are from ‘Nature’, F is from ‘Knowledge’. Figure 5. A commercial microscope slide dealer acquires material – exchange offers from Henry Ebbage that appeared in ‘Hardwicke’s Science Gossip’ during 1889. (A and B) In March and April, respectively, Ebbage asked for material that he could use to manufacture slides. He may also have sold unmounted material to customers who wanted to make their own slides. (C and D) In January and November, respectively, Ebbage asked for prepared slides. He may have resold these from his shop, a common practice among slide dealers. Such evidence suggests that some slides labeled “Ebbage” were not actually produced by him. Henry Ebbage’s shop on Caledonian Road was undoubtedly also a pharmacy. This location was the chemist’s shop of William P. Smith in 1885. The 1891 census lists Ebbage as being a “chemist”, living in a boarding house in Brixton. Based upon the census of 1891, Ebbage’s London chemist/microscopist/optical instruments shop probably stayed in business until at least the end of March, 1891. Other evidence indicates that the venture was not successful, and soon closed. Beginning in January, 1891, Ebbage’s exchange offers in Hardwicke’s Science-Gossip requested contact at his parents’ home in Framlingham. By April, 1891, his advertisements for microscope slides gave his address as Framlingham, not London (Figure 6). Figure 6. Advertisement from an spring, 1891, issue of Hardwicke’s Science Gossip. Note that Ebbage sought to acquire as well as buy slides. Ebbage published a brief article on making crystals in August, 1891 (Figure 7). This was also submitted from Framlingham: “A pretty object for entertaining friends is the arborescent growth of silver crystals. To show this, dissolve a small crystal of silver nitrate (or a piece of lunar caustic) in a few drops of rain water. Place a drop of this solution in the centre of a slip of glass, and arrange it under a low power of the microscope, concentrating the light from above by means of a stand condensing lens. Now take a piece of copper bell-wire, 1 1/2in. long, and bend it like a capital L, then bend the longer limb to form a hook, which will rest anchor fashion when laid down. Place this at the side of the drop of solution, allowing the hook to dip into it at the edge. Chemical exchange results, copper going into solution, and silver crystallising out. N.B.—Do not spill the solution, as it stains black.” This is highly suggestive of the closure of Ebbage’s Caledonian Road shop – it is difficult to believe that a chemist/microscopist would not use his business address with a publication that so obviously ties in to that business. Figure 7. An Ebbage preparation of crystallized silver, prepared as described in The English Mechanic and World of Science, 1891. Note the hole in the crystals where Ebbage had placed the copper wire. Ebbage also published a note on how to make an “extempore micro-erector”, in the October 1891 issue of The English Mechanic and World of Science (no address printed): “Beginners find a difficulty in operating under the compound microscope, owing to the reversed appearance of the object. They will be glad to know that an effective substitute for an erecting glass is a 1/2 in. or 1/4 in. objective, inverted, and resting on the eyepiece. By its means scales and diatoms may be arranged, vegetable vessels isolated, and delicate dissections made”. This suggests that Ebbage was mounting diatoms and insect scales himself in 1891. By April, 1892, Henry Ebbage had definitely left London, and his parents’ home, for Southend-on Sea, Essex (Figures 8 and 9). He established a pharmacy on Park Street. Microscope slides were also on sale, although there is no evidence that Ebbage sold microscopes, etc., as he had in London. Figure 8. An 1892 advertisement for Henry Ebbage’s microscope slides, from Hardwicke’s Science Gossip. Microscope slides labeled with Ebbage’s Southend-on-Sea address can be dated as having been sold between 1892 and ca. 1899, when Ebbage moved from that town. Figure 9. 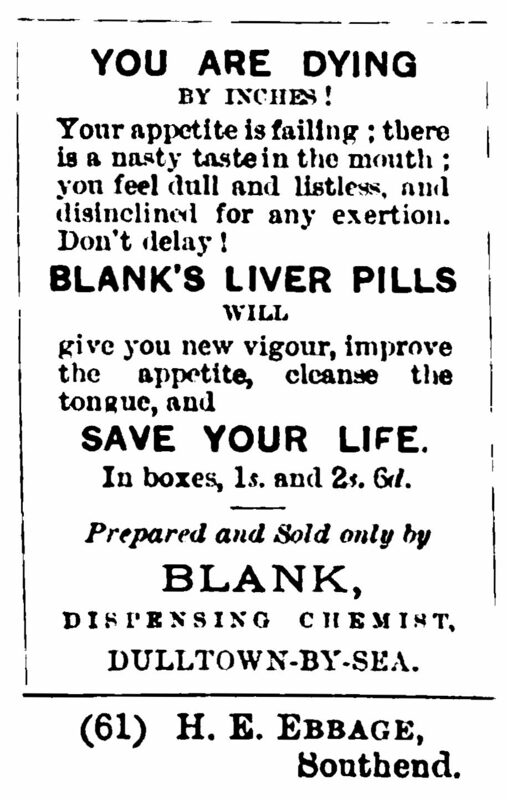 An edited version of a advertisement by Henry Ebbage, shown as a good example in the article “How to Advertise Liver Pills”, in the April, 1894 issue of ‘Chemist and Druggist’. To avoid the appearance of promoting specific medications or pharmacists, all of the example ads in this article changed the chemists’ names to “Blank”, and their locations to “Dulltown”. Then, as now, pharmaceutical manufacturers exploited fear to promote sales. On September 18, 1894, “Henry Edward Ebbage, chemist and druggist, of Southend-on-Sea” married Bessie Ellen in her hometown of South Cove, Suffolk. Ebbage’s microscopy business appears to have continued for a few more years. In 1895, he requested “A few dozen mounted Microscopic Objects; also a good dissecting microscope”. The dissecting microscope would have been useful for preparing slides. The Ebbages moved from Southend-by-Sea to Great Yarmouth shortly afterward. Henry took over the pharmacy that had been operated by James J. Owles on Hall Quay. Possibly just a coincidence, Owles was an amateur microscopist of some note, whose biography can also be read on this site. A September, 1898, advertisement to exchange microscope slides in the Pharmaceutical Journal probably came from Ebbage (Figure 10). Figure 10. An 1898 advertisement to exchange microscope slides, from the Pharmaceutical Journal. In 1900, Ebbage sought to trade away his “Beck’s small erect image microscope” (probably a dissecting microscope), and “brass mounting table with spirit lamp” (Figure 11). These trades suggest that Ebbage was ceasing his serious manufacture of microscope slides. In the May, 1901 issue of Science-Gossip, Ebbage advertised to develop camera film (Figure 12). He evidently sold his business that month, as the June issue held an identical advertisement, except the advertiser was “A. Howard (Late Ebbage), Chemist, Gt. Yarmouth”. Figure 11. An 1900 exchange offer from Henry Ebbage to trade his microscope slide-making equipment for a telescope. Figure 12. Advertisements from Science-Gossip, indicating that Henry Ebbage sold his Great Yarmouth business in May, 1901. By November, 1902, Ebbage was in Richmond, Surrey (Figure 13). He was evidently seeking a new occupation. Figure 13. 1902 advertisement placed in Nature. On January 16, 1903, Henry Ebbage was elected into the Quekett Microscopical Club. Also in 1903, Henry Ebbage passed the examination to become a member of the Spectacle Makers’ Company, indicating excellence in eyeglass manufacture. The 1906 QMC list of members recorded Henry Ebbage as living at 14 Orchard Road, Kingston-on-Thames. He was not listed as a QMC member in 1908, or any year thereafter. He advertised to sell of his entire stock in 1907 (Figure 14). Ebbage lived in Kingston-on-Thames for the rest of his life, working as an optician. According to his son, Eric (cited by Spence, 1957), Henry Ebbage “took flying lessons, and was piloting small planes at the age of 74; he was a motorist and a player in chess matches for his club. He made few slides after 1910”. Henry Ebbage died June 5, 1949. Figure 14. Going out of business advertisement, from Knowledge and Scientific News, 1907. My thanks to Pete Hodds for the suggestions, and for providing images.